Menopause is a transitional time which can bring about unwanted symptoms that disrupt daily activities and sleep. The vast array of symptoms leave women constantly search for relief. Cenestin claims to provide that relief. Decreasing hot flashes and eliminating vaginal itching, burning, and dryness, Cenestin helps bring relief to two highly known symptoms. But is Cenestin the best option for menopause? To answer this question, let us take a closer look at its components. Due to the fact that dosages can vary depending on a doctor’s prescription, they have not been specifically labeled on this product. However, dosages should be taken with food or immediately after. Users are cautioned to take Cenestin at the same time every day and never consume doses simultaneously. A specific price could not be found for this particular product due to the fact that this is a prescribed medication. Prices will vary depending on pharmacy and individual coverage. Although Cenestin can provide relief from some menopause symptoms, the overwhelming amount of side effects should be of great concern to users. The main question to ask is: do the few benefits of this product truly outweigh the major side effects? 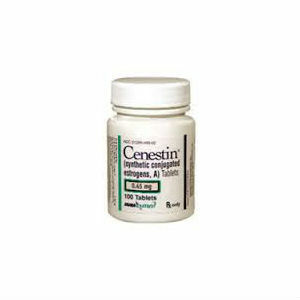 It is also a concern that Cenestin does not claim to relieve all symptoms of menopause. Therefore, consumers will have to choose another medication to treat other symptoms, thus increasing the daily consumption of pills. Jackie Horowitz	reviewed Cenestin	on July 11th	 and gave it a rating of 2.